When you think wrestling, Krishna is not the first name that comes to mind. You think Hanuman whose saffron images grace the mud-pits of traditional Indian gymnasiums known as akharas. Young men in loincloth, coated with mustard or sesame oil, can be seen in these places grappling with each other, to cheering of onlookers. Ancient India knew it as the Sanskrit malla-yuddha, while medieval India knew it as the Persian pehelvani, it is popularly known as kushti or dangal. Much loved in the villages of India, Bollywood will shortly be acknowledging it through films such as Salman Khan’s Sultan and Aamir Khan’s Dangal. But Krishna? Isn’t he dandier, with silk dhotis and sandal paste and garlands of fragrant flowers, who bends his body like a woman as he plays the flute? The bhakti side of Hinduism has focused on the Krishna of mothers and lovers: the butter-loving prankster whose music makes women abandon all household chores and dance around him all night. He even lets the milkmaids cross-dress him for their pleasure. Wrestling does not quite fit into picture. And yet, Krishna is a great wrestler. The Bhagavata Purana tells us how Krishna wrestles demons who take the form of bulls (Arista) and horses (Keshi) and serpents (Kaliya) and pythons (Agha). And, most importantly, how he went to Mathura to participate in a wrestling contest where he overpowered the state wrestling champions, Chanura and Mustika, and even the dictator, Kamsa. Later in life, he yokes seven wild bulls to win the hand of Satya, daughter of Nagnajit, king of Kosala, in marriage. The image we get before us is that of a virile Indian youth from an agricultural community participating in a bullock-cart race or bull-leaping, such as in the now controversial Jallikattu festivals of Tamil Nadu, cheered by all villagers, who feel secure that they have a strongman to protect them from marauders and oppressive kings. There is a Ram-katha that Jambuvan, the bear, wanted to wrestle Ram to see how strong he was. Ram promised him that he would satisfy Jambuvan’s wish when he would take birth as Krishna. Krishna wrestles and subdues Jambuvan and wins the hand of his daughter, Jambuvati, in marriage. 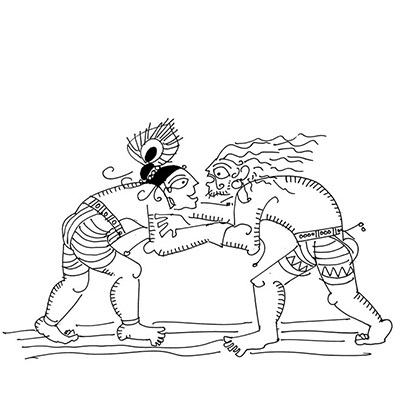 This tale suggests that wrestling was seen as a rather crude unsophisticated game, suitable for Vishnu when he is the youngest son raised by cowherds, but not when he is born as the eldest son of a king. Krishna’s elder brother Balarama teaches Bhima and Duryodhana wrestling. But it is Krishna who teaches Bhima tricks to defeat, and kill, Jarasandha and Duryodhana, at the wrestling pit. In the Ghata Jataka, the Buddhist version of Krishna’s story, Krishna and his brothers are the 10 much-feared wrestlers who kill Kamsa and conquer the whole of Jambudvipa. The Malla-purana also speaks of how Krishna taught wrestling to the Jetha-malla brahmins of Gujarat. That this mud-smeared Krishna is also the butter-smeared and sandal-anointed Krishna reminds us once again why he is called the purna-purusha, the complete man.